"5 best coffee shops in toronto you should visit". An open mind helps to appreciate the value of the variety of cultures that make Toronto. One of my favourite ways to spend time in the city is by enjoying some of the best coffee shops in Toronto. "TOP 10 BEST COFFEE SHOPS IN TORONTO"
The in-house specialty is a cardamom-spiced latte, available hot or iced—we think it’s in the running for the world’s best iced coffee. "how to spend a weekend in meghan markle's second home"
Kensington Market was known for being one of Meghan Markle’s favourite hangout spots. "swedish fika offers incentive for thoughtful socializing"
In Toronto, Kensington Market's Fika Café displays delicate rosewater-ginger sugar cookies, shaped in the café's distinctive toy-horse logo, alongside cinnamon buns, caramel, sea salt and lavender brownies and a menu of open-faced sandwiches. Opened four years ago by Toronto restaurateurs Nikki Leigh McKean and Victor Barry, and since sold to pastry chef Yadi Arifin and his partner, the friendly teal storefront is an oasis of Scandinavian-inspired design. "airy, quaint and full of lighT"
With a simple yet fresh décor including exposed beams and brickwork, FIKA Café, in the heart of Toronto’s Kensington Market, is airy, quaint, and full of light. While enjoying FIKA’s signature cardamon spiced latte or lavender white hot chocolate, you can take photographs of the colorful paintings and plants by the windows – or the most unique feature of all, an entire wall of books. across Ontario you'll fall in love with. Latte road trip? Yes please. "Their iced coffee, which was named the world's best by Conde Nast Traveler in 2013"
"the ideal place to fika"
"a food lover’s guide to kensington market". If Kensington Market were a person, it would get along with everyone. Its central location and abundance of options for food makes it an easy choice for spending a day in Toronto. "YADI ARIFIN'S WINNING AEROPRESS RECIPE"
We recently caught up with Yadi, the winner of the 2017 Toronto Aeropress Championship, to brew a few Aeropresses and learn about his award winning recipe. 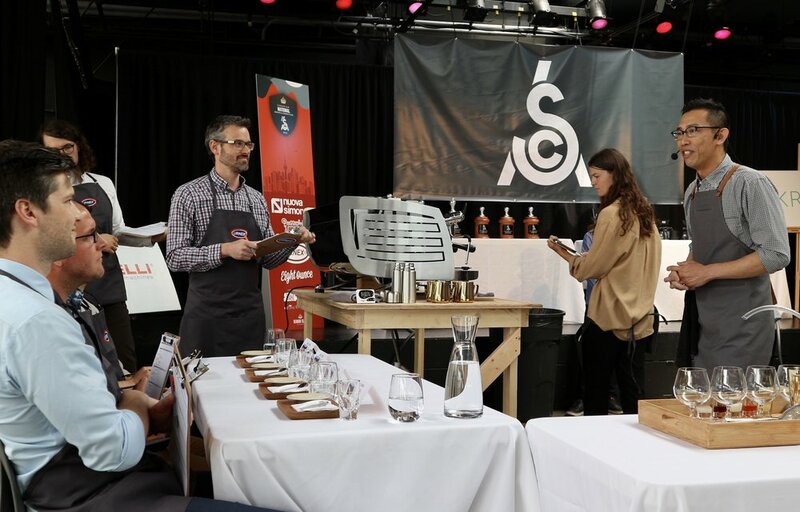 Yadi, former pastry chef and owner of Fika Cafe in Kensington Market, recently competed in the National AeroPress Championship hosted by Dogwood Coffee in Winnipeg. Yadi competing for the first time at the 2018 Canadian National Barista Championship, placing 8th overall. Yadi Arifin owns the adorable Fika Cafe in Kensington Market. He also won the 2017 Toronto AeroPress competition, so we thought we chat with him, hear his story and and see if we could pick up some tips and tricks from the master. What are you trying to accomplish at Fika Cafe? - Of course, serve good coffee. Having good coffee and serve it right. Do the best you can. Sometimes I go to a shop, and I know they have good beans, but if the barista is tired and they don’t do a good job, then you’ll be disappointed. That is the challenge for every café, you know? That could happen here too. 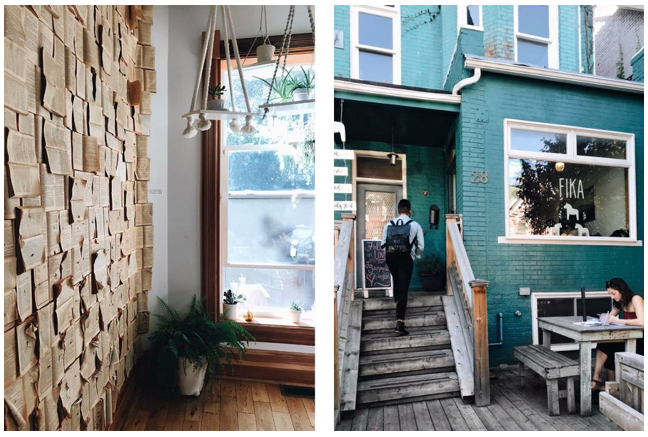 "21 bucket list Coffee shop"
all torontonians need to go to. Something to warm you up! "walls lined with old book pages"
Tegan & Sara at Fika Cafe. ...Fika, which lives in an adorable renovated house. While the barista in the cafe got started making Tegan and Sara's drinks, the three of us, along with a camera crew who was capturing the whole experience, went to a cozy back room that had walls lined with old book pages so we could chat about their real love of coffee and how they legitimately believe Canada has some of the best on offer..
"cutest, coziest little cafe in Kensington Market"
"fika - to go out for coffee"
Canada’s web guru Liz loves the “IKEA meets Pinterest” minimalist décor at Fika (which is a Swedish verb meaning “to go out for coffee”) in Kensington Market..
to eat and drink in Toronto's Kensington Market." "natural light and exposed brick walls"
...named for a Swedish verb which means “To go out for coffee”. I also learned (from their beautiful website) that it’s also a noun, as in “coffee break”. Therefore the whole vibe is kinda “Swedish” without looking like IKEA at all. Infact, I loved the interior which has soothing paint colours and natural blonde trim plus lots of natural light and exposed brick walls.